All Winslow homes currently listed for sale in Winslow as of 04/22/2019 are shown below. You can change the search criteria at any time by pressing the 'Change Search' button below. "Beautiful expansive brick front home with all the upgrades. With over 3600 sq. feet of luxury living you can not go wrong. This home has it all. Two story foyer entrance with hard wood flooring and double staircase greets you as you enter. To your right is the formal living room and to your left is the large formal dining room. There are beautiful h/w floors through out. The recessed lighting continues through out the home. The kitchen is very large and upgraded with granite tops, 42'' cabs, center island and cook tops, built in range and double sinks just to name a few upgrades. There is also a breakfast room with vaulted ceilings overlooking the yard, family room and kitchen. The family room has 2 story ceilings, gas fire place and palladium windows. Also on the first floor is the office, laundry area, half bath and two car garage access. Upstairs you will find four gorgeous bedrooms. The master bedroom has a sitting area, tray ceiling, double walk-in closets and a master bathroom with custom tile work, garden tub, double sinks and separate stall shower. The basement is ready to be finished and is massive in size!" "WOW!! 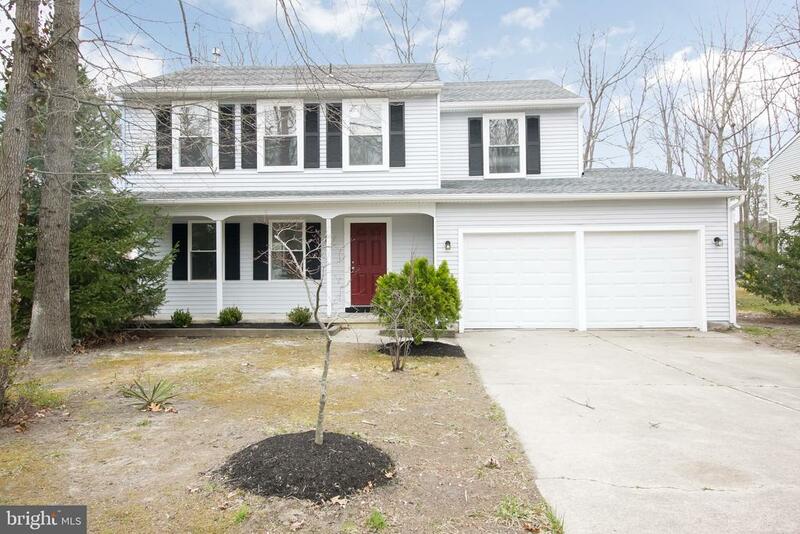 Two story, two car garage, single family home, remodeled and looking great awaits one lucky person!! This floor plan is open, light and bright. Living room and dining room allow for great entertaining. Kitchen has granite countertops, gas range, tiled backsplash, recessed lights and ss appliances. Sunken family room with recessed lights and sliders to rear yard. Laundry on main floor as well as half bath. Large unfinished basement has so many possibilities. Upstairs Master bedroom with master bath, stall shower, tiled walls and floor, and a walk in closet. Three additional bedrooms all of good size, ceiling fans and new carpet. Main bath, tiled tub walls and floor. Two car attached garage. Very nice location easy access to Atlantic City. Call today for your personal tour but please hurry.."
"Beautiful 3 story town home with an open floor plan. You can move right in. Just a few of the upgrades are: New carpet on all steps and upper level bedrooms. Freshly painted the majority of the house. Refinished hardwood floors in natural matte finish through out main or second level. All of the Hall lights are new. There is also new flooring in the entry way. New bathroom vanity lights. Enjoy the lower level recreation room and the convenience of a 1 car attached garage.This home has gleaming hardwood floors in many of the rooms. It has been very well maintained and it offers so much living area. The association has so much to offer, swimming pool, community center, tennis and basketball courts as well as a playground and low association fees. Come and see for yourself. You won't be disappointed." "Bigger than it looks!! In great move-in condition. Two Story/Cape Cod style has four bedrooms!! Two bedrooms on the second floor ... with a nursery!! Two bedrooms on the first floor. But wait ... there's more ... Living Room, Eat-in Kitchen, separate Dining Room AND a full basement... with storage, too! Newer Hot Water Heater, newer well pump. Oil furnace replaced in 2007. And the Garage!! Huge! Detached! Easy to get to just about anywhere ... located near the A.C. Expressway entrance." "Perfect Investor Property. Winslow Township. This property is located in the desirable Winslow Junction section. Over 1,800 Sq FT of Living Space. Large bedrooms and Large family room. The exterior of the home is mage of durable cinder-block. There's natural gas on-site, the furnace (hot water boiler) appears to be in operable condition. Modern submersible well. Detached 1.5 car garage. Septic will need to be replaced. This property is being sold strictly as is with the seller making no repairs. The buyer will be responsible, at their own cost and expense all certification and repairs after settlement. Call Today!"